Suffolk County Legislature Presiding Officer DuWayne Gregory served as the keynote speaker for the National Wreaths Across America Day celebration at Calverton National Cemetery. 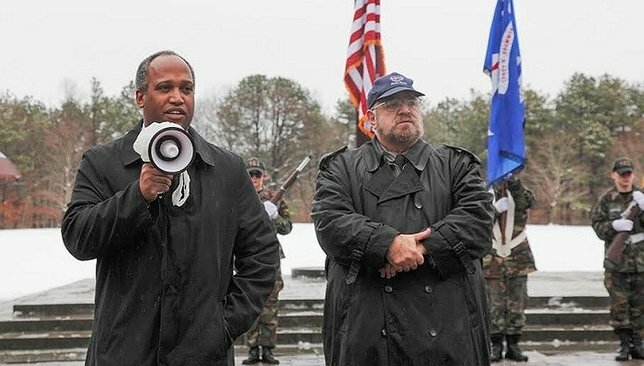 Presiding Officer DuWayne Gregory speaks alongside Gerald Manginelli, Vice President of the Support Committee at Calverton National Cemetery, at the Wreaths Across America Day ceremony at Calverton National Cemetery on Saturday, December 17. Photo by: Office of Suffolk County Legislature Presiding Officer DuWayne Gregory. Amityville, NY - December 19, 2016 - Suffolk County Legislature Presiding Officer DuWayne Gregory served as the keynote speaker for the National Wreaths Across America Day celebration at Calverton National Cemetery and presented a proclamation to the cemetery’s support committee on Saturday, December 17. “On behalf of the residents of Suffolk County, it was my privilege to take part in honoring the memories of the brave men and women who sacrificed their lives to serve our country,” said Presiding Officer Gregory. Photo courtesy of the Office of Suffolk County Legislature Presiding Officer DuWayne Gregory. 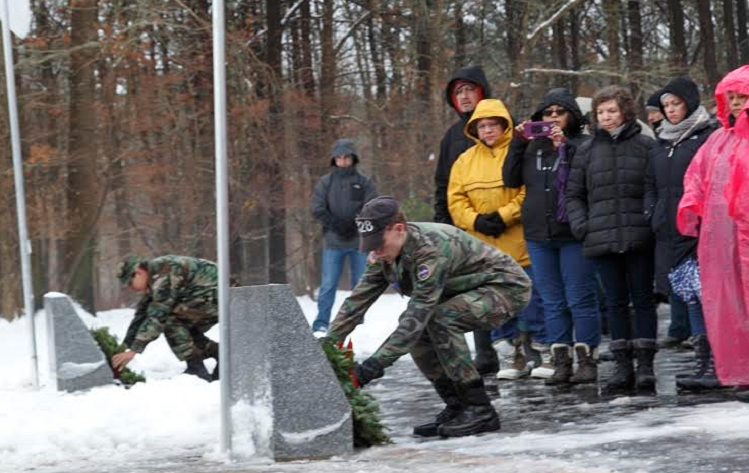 Volunteers hold ceremonies and place wreaths on individual veterans' graves to remember and thank them for their service. These ceremonies also take place at sea and at each of the national cemeteries on foreign soil. Celebrate the Savory Aroma of Garlic with these National Garlic Day Recipes! CELEBRATE VALENTINE'S IN AMERICA'S BORDEAUX! Subject: LongIsland.com - Your Name sent you Article details of "Presiding Officer Gregory Serves as Keynote Speaker for 'Wreaths across America' Day at Calverton National Cemetery"